It's time for the New Product Launch! All the Stamps, Die-namics, and Stencils can be found HERE. 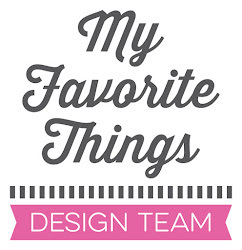 Please remember to visit each of the MFT Designers' March New Product Launch posts on the MFT Blog and leave a comment by the end of the day on Thursday, March 5 for your chance to WIN one of two, $100 Gift Vouchers. The winners will be chosen at random and all the prizes will be sent out on March 6. Ready? Set. Comment! With all the fabulous pet themed projects being released this month, I couldn't resist making a project of my little guy, Tibbs. Tibbs is a small dog with a HUGE personality! I created this tri-fold frame for my desk, it features my favourite puppy and a few of my favourite new products. 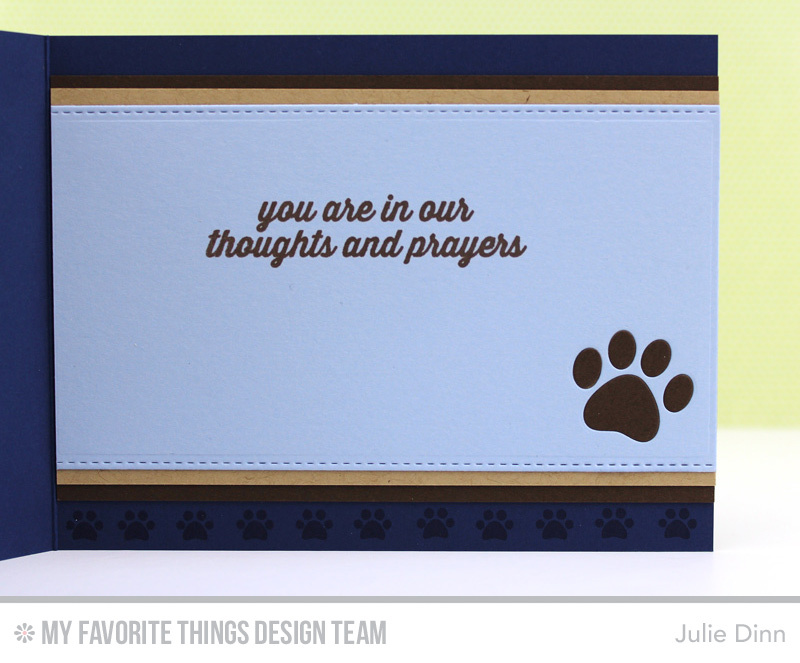 I stamped the Blue Breeze card stock with Blue Breeze Premium Dye Ink and the Paw Print Background. The frames were created with the Stitched Square Frames Die-namics and After Midnight card stock. I used a number of dies from the Pet Accents Die-namics to decorate the photos. The paw print heart on the first photo is one of my favourite dies. The sentiments are from the You Have My Heart and I Knead You stamp sets. The sentiments were stamped on flags die-cut with the Blueprints 23 Die-namics. My next card makes me sad. Just the thought of loosing a beloved furry friend brings tears to my eyes. Sadly, it is something that every pet lover must experience. I like to have a few pet sympathy cards on hand for those times when the need arises. 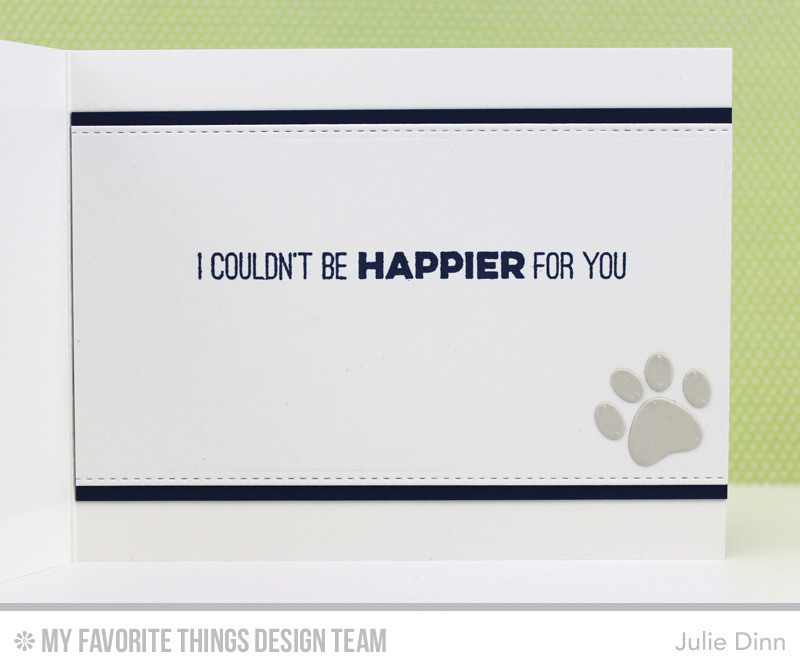 A simple paw print and sentiment is all that is needed to convey the reason behind the card. I paired the new Blueprints 23 Die-namics with the Pet Accents Die-namics. The sentiment is from the Get Well Wishes stamp set. For card stock I used After Midnight, Blue Breeze, Kraft, and Chocolate Brown. Along the bottom of the card, I stamped a line of small paw prints. My final card is for a happier time! I created this card to congratulate a friend on their new rescue puppy. I LOVE the paw print heart from the new Pet Accents Die-namics, it's so sweet. I paired it with the congrats die from the Celebratory Greetings Die-namics. On the inside of the card, I stamped a sentiment from the Totally Happy stamp set. I finished off the card with another small paw print. Your pup is so sweet, love all your projects! I love that tri-fold frame idea. Wonderful. Cute, cute, cute! Love the tri-fold with those adorable pictures! Adorable projects. Such a nice frame for your cute puppy's pictures. Very nice project ideas! I wish I could live in MFT land, so many goodies!!!! OMGosh what a great idea, love those picture frames. Adorable cards. Cute puppy. Can't wait to get the stamp and die sets. Hope I win. Thank you for the chance. Love the mini album. And the Congrats card is too cute. Just love the picture frames and you're adorable doggie. Great new release. I am so loving the new cat and dog stamps and dies. I liked how you put a personal photo in and created your card holder. How fun are your cards. Your little puppy is so darling! So adorable and sweet! 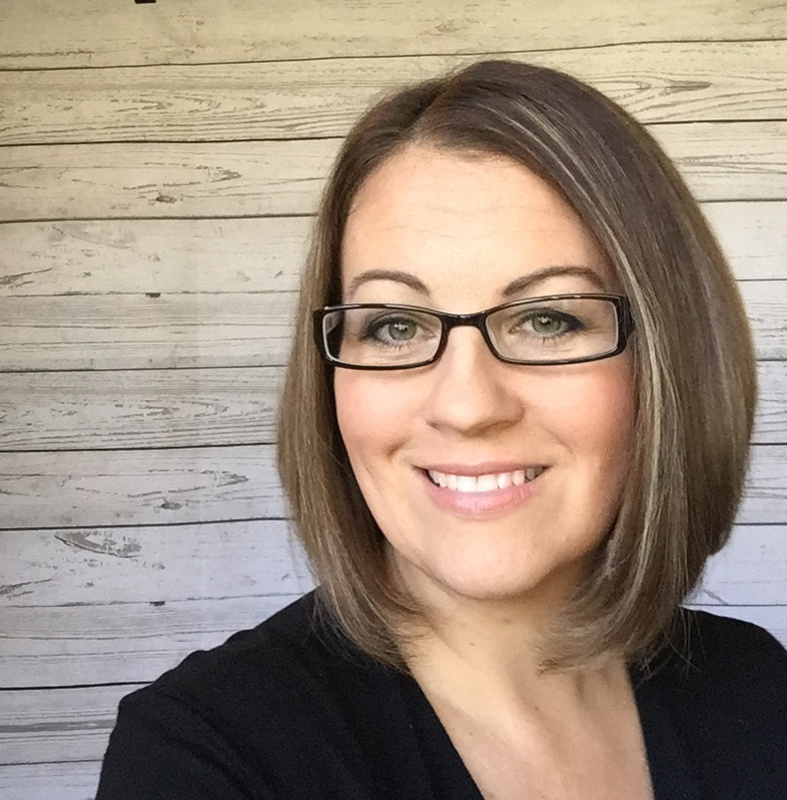 Love your samples! These are wonderful! What a cute dog you have! 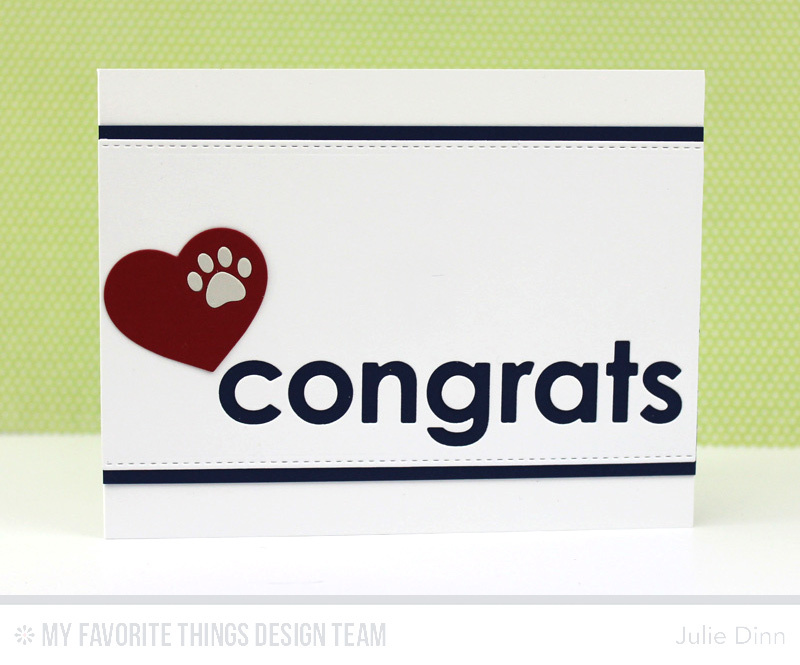 Love all these projects, and it's such a great idea to make a congrats card for someone adopting a new pet! 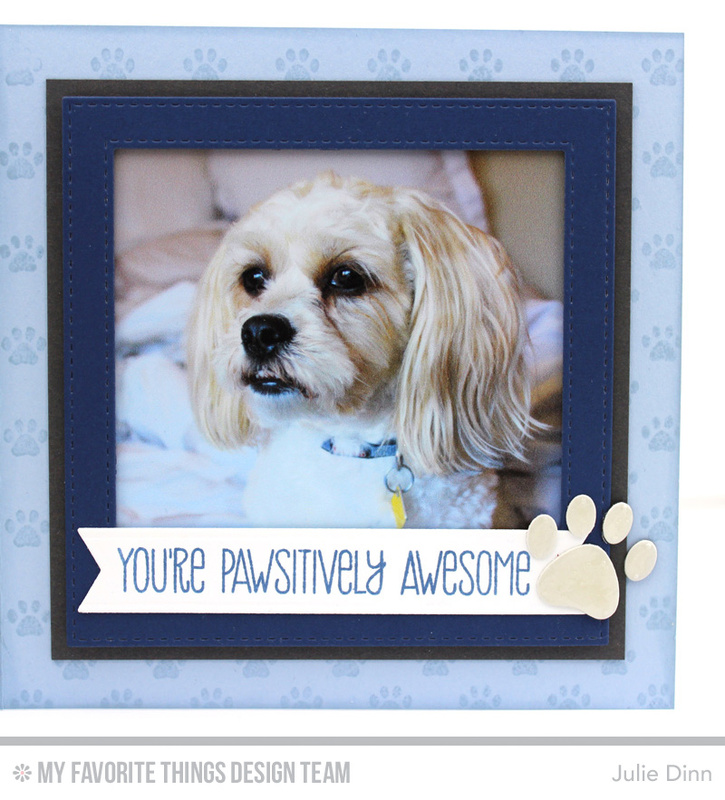 LOVE your pup and the frame you created for his pictures is adorable. Well that doggy is ADORABLE!!! LOVE all your projects! Thanks for the fab inspiration! Great desk frame. Love that. Awwww...How Cute!!! Great projects. Love the new Stitched Square Frames! Awww...your pup is adorable! Great cards too, the new rescues card is darling! Great cards....your fur baby is adorable! Great projects. Love you photo triptych - what a cutie! What a cute dog! Love your triple frame. The cards are very nice, too. Love your triptych, sweet photos and fun sayings! Oh My Goodness!!!!! Totally and completely ADORABLE! Sweet furbaby and creations. LOVE!!!! If I didn't see another project today it would be OK, because these that you have posted are out of this world. You get a big A+ from me. beautiful idea, thanks for inspiring me! Ah, your cards are adorable!!! LOVE the theme and such a sweet looking doggie! GORGEOUS designs!!! LOVE the trifold frame!!! Such WONDERFUL creations Julie!! With such pretty CAS designs they will be perfect to CASE for future adoptions and losses (sniff sniff!) LOVE the trio of frames you created to showcase your ADORABLE pup too! Thanks for all the inspiration! Nice to see Tibbs in your card, makes it very personnel. What a cute puppy!! I love how you used the new stamps and dies to scrapbook!! Fab! I just LOVE that pawprint on the heart! Such cute cards and frame - I love the CAS look. Your projects are so sweet, they would make anyone smile. 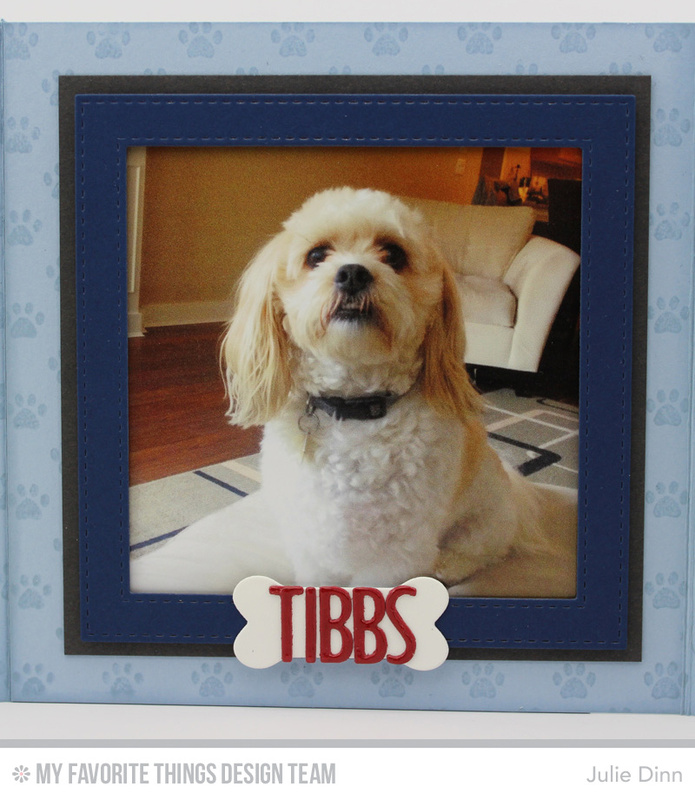 I love your photo display of your puppy, Tibbs. So cute! Your symparhy card is purfect and so meaningful for such a sad occasion. WOW love your Adorable creations. Especially that 3 frame creation!!!! Beautiful cards and love your photos. Great ideas! Oh, my goodness, these are SO CUTE!!! cute cute cute! i love all of these! i can't wait to make a pet display for my desk too- so adorable!! Love the tri-fold. Good way to show off your skills and have your furry friend on display all the time. Your puppy is soooooo adorable!!! Awww, Tibbs is adorable and so is your project!!! The cards are awesome too!! Great work!! Love the frame! Love how it was used for a sympathy card - very versatile! Awwww...love the framed pictures you created of your puppy! Awesome cards and lovely picture frame! Wonderful cards and love the frame. Adorable way to see your cutie! Your tri-fold is à great idea , nice des decoration. How cute is that frame!!??? What a great idea. And the cards are fabulous! Cute cute cute.. Love the frames on the Tibbs. He is a doll baby. Your cards turned out great. Thanks. Love the tri-fold frame--what a cutie! Great cards--those are so hard to make--thanks for the inspiration! OMG!! Such adorable creations!! Tibbs is such a cutie!! The paw prints are just darling. You have a super cute dog and I love all of your projects. Terrific creations! Love your little doggie too! What a great idea for exhibiting your photos. I was pleased to see the sympathy card, when I recently lost one of my dogs it was comforting to know someone understood. Thank you for sharing your talents. Adorable dog! Great projects for your little special dog! Great cards, but your frame takes the cake!! Adorable puppy!! What a wonderful frame, great idea!! Ok, I think these are my favorite! The dog in frames is absolutely adorable!!!! How versatile are your frame sets. Love them all! The frame set is so, so, adorable! Gibbs is a real cutie too! What would our lives be without our furry companions! Love them, Jules! What a sweet frame set! Aw, such sweet pups! 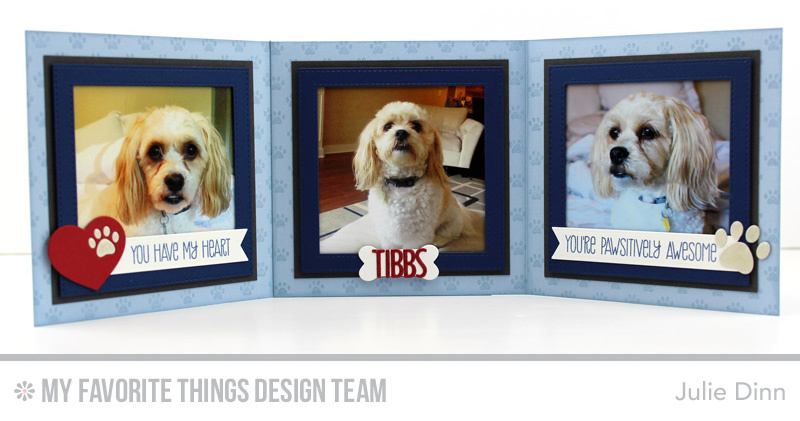 Love the tri-fold and your cards - adorable! OMG this is filled with such Adorable Cuteness...I'm screaming over here. Love that panel card and your fur baby is sooo Ca-Ute! What a creative idea to make a tri-fold photo frame! So awesome! Oh my goodness!! Your puppy is so cute!! Thanks so much for sharing your project!! What a sweet little dog...and card! 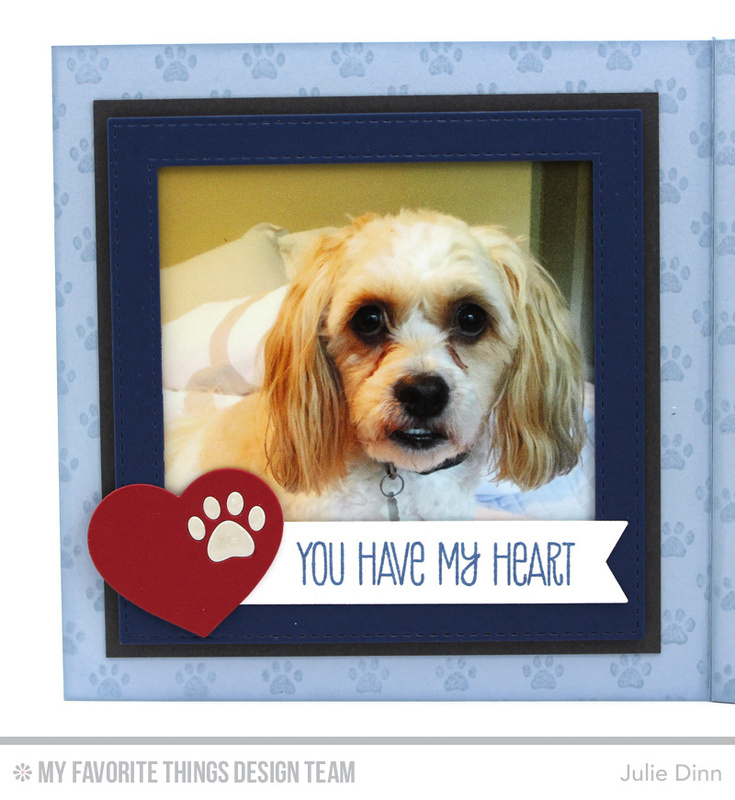 Sweet cards and Fantastic Frame of your puppy dog! Love them all, thanks, Paulette S.